I see Cheikh Gueye. White shirt, white hoodiecoat, white shoes; black dreadlocks, black handlebar mustache, black skin; white cigarette dangling from his mouth. A cocoa skinned girl at his side, smiling, sporting a small afro out of which hang a few stringy dreadlocks. He enters the dingy lobby and we greet each other before taking the elevator to Sexto Kultural on the sixth floor. When I called Cheikh about interviewing him for a story I’m writing about La Bomba de Tiempo, the popular improvisational percussion group in Buenos Aires of which he is a member, he told me to meet him here, in this concrete building that sits between a cemetery and an overgrown train yard in a neighborhood in west Buenos Aires called Chacaritas, where Cheikh teaches African drum and dance classes. Upstairs, a man and a woman, a large drum slung over each of their shoulders, are waiting outside the elevator. We walk through a large open space to a smaller back room, almost empty. I don’t say much. My Spanish skills are only intermediate, a fact he does not know, and he speaks no English. I just sit on a metal container and watch. Three hanging bulbs cast fluorescent light over the dirty white walls; three clear windows reveal the red sunset. Gradually some more people arrive, each carrying some variety of African drum. They exchange greetings with one another and with Cheikh, who sits by the window overlooking this part of the city while the others tune drums or stretch. When they are ready, Cheikh rises. He moves to the middle of the room, five drummers in front of him, three dancers behind him. No words are spoken. Cheikh simply gestures with his hands and vocalizes some rhythm. Then they explode together–BOOM ba-da-boom BOOM– a seamless transition from silence. 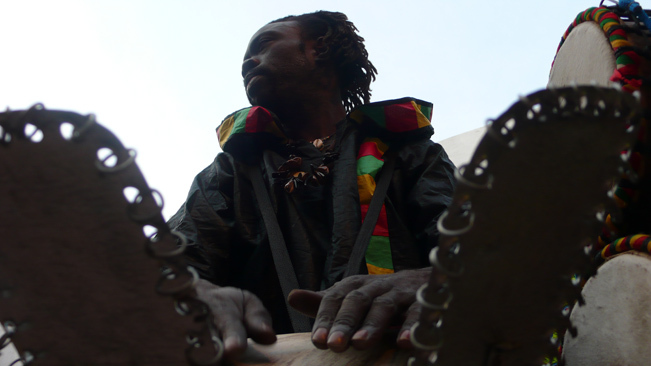 Drummers activated, ba-da-boom BOOM–Cheikh faces the dancers, demonstrating with his body the moves they are to perform. Cheikh is Senegalese. He came to Buenos Aires about a decade ago. There’s a large Senegalese population in Buenos Aires, immigrants like Cheikh. Many can be seen in crowded shopping districts or major thoroughfares hawking knockoffs. But many are skilled musicians and dancers, and in La Bomba de Tiempo, Cheikh plays in front of thousands of people every Monday night. Watching Cheikh guide the group, sitting on that metal container and feeling the percussive vibrations resound against my heartbeat, I thought about the beauty of one person’s culture becoming something truly shared at the most essential level. I thought about my own experiences at La Bomba, how the weekly ritual had become a part of my own personal culture. I thought about how some things are just human things. As I listened, I felt my thoughts melt away and became conscious of another rhythm. Tap ta-ta-tap tap. My hands had begun to drum out a beat of their own.